First decide how much you are willing to pay for an egg incubator. A low-cost incubator generally has the fewest features and therefore requires close supervision to get good results. So in considering price, also weigh the time factor — do you want to spend a lot of time fussing over your incubator and will you always be readily available to do it? Incubators come in a range of sizes, from tiny models that will fit on a bookshelf to large cabinets the size of a small refrigerator. Between the two extremes is an array of tabletop models in an assortment of sizes. Choose a size that will not only fit the space where you intend to operate the incubator, but also accommodate your available space for storing the incubator when it is not in use. Incubators for home use can hatch anywhere from 3 eggs to 300. 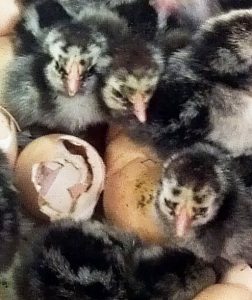 In determining how many chicks you hope for, remember that not all the eggs you put into the incubator will hatch; a reasonable hatch rate is 80 to 85 percent. With experience you may coax your incubator to a higher hatch rate; with less attention to detail, you’ll get a lower rate. Incubated eggs must be turned periodically. Low-end incubators require you to turn the eggs by hand, while upscale models have automatic motor-driven turners. Eggs of the size you plan to hatch must fit into the turner. Some incubators come equipped for standard-size chicken eggs, with optional turners available for eggs of other sizes. Sometimes incubators and automatic egg turners are sold separately, so you can select the turner size you need. Without a turner, you must be on hand at least three times a day, every day, to turn the eggs yourself. For proper embryo development an egg incubator must maintain a steady temperature. A fully electronic model shows the temperature readout in an easy-to-read digital display. Other incubators use a separate thermometer, which may or may not come with the incubator, may or may not be electronic, and may or may not be easy to read. The temperature is controlled by a thermostat, adjusted either by a dial or by touch pads or buttons. Some high-end cabinet incubators have an alarm or light that signals when the temperature varies outside the desired range. An incubator needs good airflow to replenish oxygen used by developing embryos and to remove the carbon dioxide they expel. All incubators have vents to admit fresh air and remove stale air. A circulated-air incubator has a built-in fan to steadily circulate warm air and maintain a uniform temperature throughout the incubator, resulting in a better hatch rate. A less expensive gravity-flow incubator relies on gravity to let warm, humid air escape through vents in the cover, which in turn causes fresh air to be drawn in through vents in the bottom. For a successful hatch, moisture must evaporate from the eggs at just the right rate. To regulate the rate of evaporation, water gradually releases moisture within the incubator. The water container may be a pan inside the incubator, or an external bottle that automatically feeds water into the incubator. Some high-end incubators have a fully automated internal water pump. In all cases, the water container must be refilled as needed to ensure it never runs dry. You can monitor humidity by examining the growth of an egg’s air cell as the embryo develops, although an instrument for measuring humidity, called a hygrometer, requires less egg handling. Some high-end all-electronic incubators use computer technology to sample the humidity and temperature within the incubator and give you a continuous digital readout in percent relative humidity. If you want to watch what’s going on inside your incubator, especially during the hatch, opt for a model with a large observation window, clear plastic cover, or transparent door. Incubators for classroom use typically have large observation windows. Some incubators have tiny windows, or none at all, which presents a problem for the inquisitive operator who keeps opening the incubator to see what’s happening — to the detriment of the developing embryos. Hatching makes a mess, so you’ll want an incubator that’s easy to clean and sanitize between hatches. If the incubator is made of Styrofoam, make sure it has a plastic liner that may be removed for cleaning, thus protecting the bottom half of the incubator from cleanup wear and tear. Hard plastic, fiberglass and wood are more conducive to scrubbing. Some cabinet incubators are too deep to reach all the way to the back, in which case you’ll have to either disassemble the back panel or hinge and latch the back panel for ease of cleaning. Once you settle on your must-have features, study not only manufacturers’ descriptions, but also online reviews by previous users. Get the best incubator you can afford that has good reviews, and you won’t be disappointed.